Fuscia/hot pink and white 100% merino hand felted shrug / collar with sewn on white organza ties. Can be worn as a shrug, tied with a bow at the back, to add a little quirky glamour to any outfit ... jeans with skinny top or wedding and party outfit ... or worn 2 ways around the neck for warmth and winter comfort. This shrug is reversible with a thick edge of hot pink on one side and a narrower edge on the other side. The organza ties are finished with hand felted bobbles at the ends. It's wonderfully flattering and is suitable for a small to medium frame. 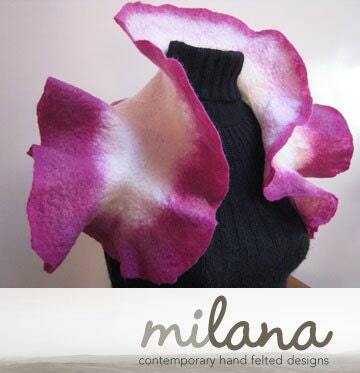 Folksy :: Buy "OOAK Nuno felted flower scarf"
Folksy :: Buy " Pink Felt Curvy Handmade Handbag"